A wonderful weekend workshop with Rebecca Wild was sponsored by Friends of Calligraphy. Nature inspired, we made our 7"x7" pieces. Rebecca returned, from a few years ago, to share with us more techniques she uses for her art. It was a wonderful two days. Magic tape, Strathmore 700 paper, self stick clear shelving, Golden mat medium, acrylics and soft pastels were our main tools. (I must get Pan Pastels. I was able to use some of Rebecca's and loved the pigments) Here is the photo of the four I created. 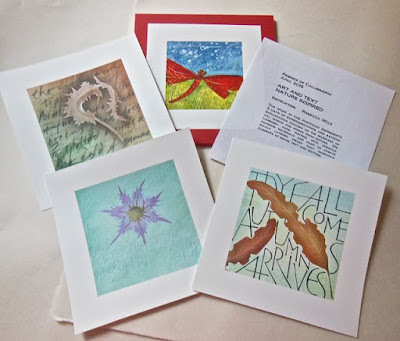 It is really wonderful that she had us make a portfolio, to keep our pieces for reference. These are our 'practice' pieces. The portfolio is made with Canson MiTientes red with the last piece done with acrylics. The others were done, mainly with soft pastels.